This bike was restored as needed. The engine has new pistons, rings, and valves, and the carburetor has been rebuilt and the cables and controls are all new. It has new paint and mufflers. This Daytona is ready to ride. The 'Daytona' name was derived from American rider Buddy Elmore's win at the 1966 Daytona 200 race held at the Daytona International Speedway in Daytona Beach, Florida. He achieved an average speed of 96.6 mph (155.5 km/h) on a 'works special' Triumph Tiger 100 and secured Triumph's first Daytona road race victory. The 500 cc Triumph Tiger 100 Daytona (T100T) was developed by Triumph's Chief Engineer and designer Doug Hele and launched as a production motorcycle the following year. 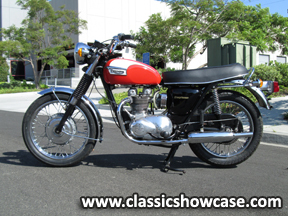 Based on the setup developed for the 1966 Daytona races, the T100T was fitted with a new cylinder head and twin Amal Monobloc carburetors. In the head, the valve angle was reduced by two degrees and the intake valve size increased as a result of testing; the valves on test engines had a worrying tendency to meet during the overlap period. Derived from Edward Turner's original twin cylinder design and a development of the Triumph Tiger, the 'Daytona' sacrificed low-speed tractability for a pronounced power step at 3,500 rpm that helped it to compete with the advanced designs from Japanese manufacturers like Honda. As well as decreased engine flexibility, however, the increase in power reduced the life of the valve gear, leading to heavy oil consumption.